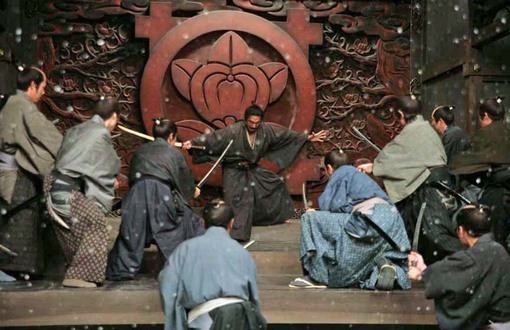 In Takashi Miike's "Hara-Kiri: Death of a Samurai," power and tradition crush good people, just as they did in Masaki Kobayashi's 1962 version. 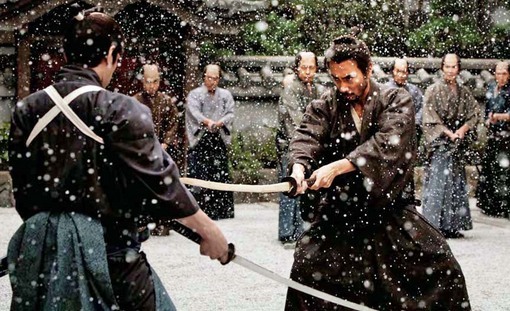 Both films are expressions of social rebellion, but where Kobayashi's conveyed a spirit of righteous vengeance that anticipated the course of its revolutionary decade, Miike's is more plaintive and despairing. There are struggles, but nobody wins, ever. Weak and cowardly people who happen to be tending the levers of power simply carry out meaningless rituals that destroy lives. 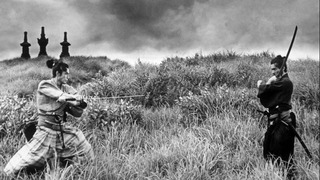 As in the '62 film, through flashbacks we get a good, long look at the lives an inflexible Samurai code has destroyed. With the elegance and shyness of an Ozu domestic drama, Miike renders a family formed under bittersweet circumstances: A poor Samurai dies, leaving his son in the care of his old war buddy, a fellow widower with a daughter of his own. Raising these children in early 15th Century peacetime means drawing from meager earnings as an umbrella maker rather than as a soldier of fortune. Hanshiro Tsugumo (Ebizo Ichikawa) might have been tough on the battlefield, but he imparts a gentle nature, not a warrior's stoicism, to the boy, Motome Chiziiwa (Eita). Motome becomes a schoolteacher and, inevitably, marries Hanshiro's daughter Miho (played as an adult by Hikari Mitsushima, the radiant star of Sion Sono's Miike-like masterpiece, "Love Exposure"). He fulfills both obligations with his father's patient, nurturing ways. Miike, the provocateur who has often toyed with the squeamish viewer's threshold for graphic violence, is just as mischievous with the restless viewer's patience for simple human interaction. In an age where even domestic dramas are cut together like iPhone footage of a prison riot, Miike's steady compositions and lifelike rhythms are truly radical. For a good while, Harakiri simply observes this family's quiet milestones and modest, improvised rituals with an adoring eye. The filmmaker seems determined to prove that the slightest of conflicts and tensions can provide drama; that wonder and spectacle can reside in such seemingly mundane events as three people sharing a rice cake. It helps that we know that trouble is coming. One major special effect here is human kindness. The death scene of Hanshiro's friend in particular is a striking departure from Kobayashi's "Harakiri." In the old film, Hanshiro's vow to guard his friend's Chiziiwa's son with his life is relayed through a superior after Chiziiwa commits hara-kiri, ritual suicide by sword. There is fear and suppressed sadness, sure, but it's still a matter of a noble samurai squaring his jaw and shouldering his responsibility. 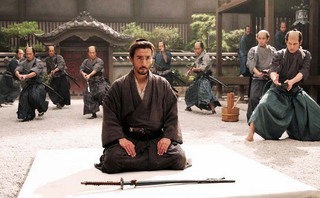 In Miike's film, Chiziiwa doesn't commit hara-kiri but dies mainly of stress. Overseeing a castle construction project, he has a heart attack while struggling to convince his impatient workers to wait for approval from the Shogun before proceeding to the next phase. They ignore him and keep working. 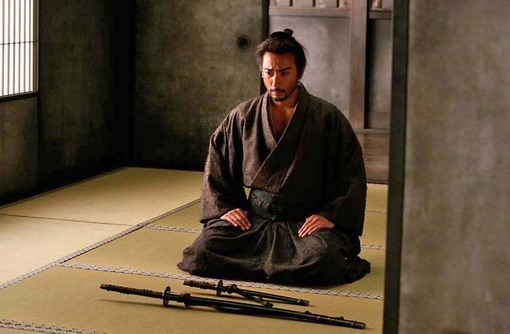 On his deathbed after the heart attack, fearing the future now that the Shogun has deposed their samurai master and cast his warriors out of the castle, he uses a few of his last breaths to ask Hanshiro directly to look after his son. It's a moment beyond samurai protocol, a devastating farewell between best friends. The thesis is clear: Decent, humble and compassionate people who put others first deserve to live out their lives in peace. The chain of events that put this simple truth in direct conflict with shogunate law is as dizzying in this "Hara-Kiri" as it is in the older film. Beyond the fact that the new film is in color (and, in some venues, 3-D) and the old one in black-and-white, the real distinction is in how Miike lingers on, well, everything. He devotes as much attention to the horrors that unfold after Motome runs afoul of Saitou (an imperious Koji Yashuko) get as he does the sweeter moments of family bliss. The father's final confrontation with the stooges of an inhumanly rule-bound samurai elite is no swift, thrilling showdown. It's a fit of protest that turns into a protracted assassination. On the big screen, this digitally-shot film looks vibrant, but the 3-D is entirely unnecessary. It provides no immersive qualities that the story itself doesn't furnish. (Still, the opening credits in ornate kanji script did hover nicely.) On the small screen, the colors pop as sharply as the black-and-white cinemascope photography in the '62 version snapped. The blood red of the samurai compound's chambers and the charcoal tones of Motome's tattered hut convey strangely appropriate extremes of authority and domesticity. Ryuchi Sakamoto's musical score is characteristically warm and emotional where Toru Takemitsu's music for the original was characteristically terrifying. Sentimental or not, Miike's version is potent stuff, deeply relevant to our times. 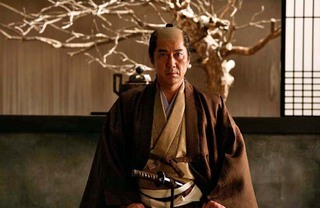 Just as the psychopathic feudal lord who used warriors and civilians as destructible play toys in Miike's "13 Assassins" could be read as a Bush-era war hawk or a terrorist mastermind, those samurai in Harakiri who persecute Motome out of self-interest are as obsequious to corrupt power as some of us Americans might find ourselves in the near future -- depending upon which way our lobbyist-beholden representatives in government vote on crucial freedoms. In that sense, Harakari is ultimately about what constitutes real honor and courage in a tilted system. Which men truly deserve to hold their heads high? Is a schoolteacher who will make the ultimate sacrifice to save his family less honorable than a warrior who will do anything to save face? And what does it take to make someone defy traditions that served a purpose once upon a time but now only provide cover for fanatics, thugs and tyrants?